Sole E25 Elliptical Trainer Review By Industry Experts. The Sole E25 Elliptical Trainer is On Sale! Note: The reviewer has owned the Sole E25 for the last 7 years and has had no service issues and is generally very pleased with the purchase. The Sole E25 elliptical trainer is one of the better values at the competitive $999 price range. This newest model now includes Bluetooth capability and a white backlit display for easier viewing. For the money it is a reasonably stable and durable machine with a good service record. Although there are some structural differences between the E25 and their higher price models. 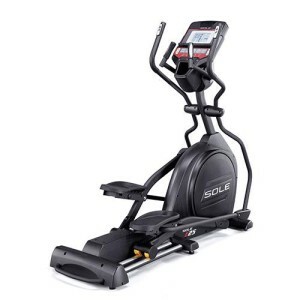 The Sole E25 is built on a frame that is 11″ smaller than their other ellipticals. The smaller size has a minor impact on the stability, of course it makes it more compact. The other models with an 82″ frame take up considerable space. Get the commercial grade Sole E25 elliptical at a residential price of only $899.99. Like the other Sole ellipticals, the E25 is a front drive elliptical with pedals that run on railings. It comes with a 20-22″ stride length, giving it a nice long elliptical motion. The E25 offers a wide range of resistance levels, with a total of 20. This means there are small incremental changes when you go from one level to the next. The E25 comes with a very basic LCD display, with a white backlit screen. The white backlit screen allows for easier viewing. You’ll notice in the photo that the E25 comes with a built-in fan. A popular feature, but don’t expect to get blown away. You also get built-in speakers with a plug-in for your MP3 and iPod player. The quality of the sound is not all that great, but it is nice having the music focused directly at you. Bluetooth Capability – This model has Bluetooth capability that allows the machine to communicate with your smart device. Simply download the free Sole Fitness app and then track your workout stats after each session. White Backlit Display – Another new feature on this upgraded model is a white backlit display instead of the old blue style. This type of screen is designed for easier viewing. Incline Adjustment — The Sole E25 elliptical was upgraded from a manual to a power incline, where you can adjust to 15 different incline levels. It is similar to the ability to adjust the incline on a treadmill. By changing you can better target and tone your lower muscles. It also gives you a serious cardio workout when you increase the incline. Articulating Pedals – They angle with the elliptical motion to reduce stress and strains to your foot and ankles. Installed Programs — You get a nice selection of exercise routines. Our only criticism is that you can only make adjustments to the incline to increase the intensity, you cannot increase the resistance. Therefore, the manual settings or the user defined setting are your best choice. Heart Rate Control — The Sole E25 offers heart rate control with the a wireless strap. There are two heart rate control programs, or you can adjust the intensity of your workout manually. Many consider working out by your heart rate as a very efficient way to burn calories and get into shape. 20 lbs. Flywheel — The weight of the flywheel contributes to a fluidity and the naturalness of the motion. 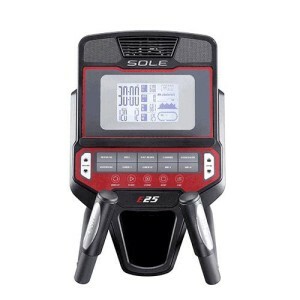 The Sole Fitness E25 has Bluetooth capability. This new technology helps bring the Sole Fitness machines into the game as far as workout tracking statistics. A free Sole app is available for your smart phone that allows you to keep track of your workout statistics. Plus, this model includes a white backlit screen for easier viewing. We would not recommend the E25 for someone planning on strenuous workouts. Also, although they put the user weight at 325 lbs., I would put the limit at around 240 lbs. There are switches in the moveable handlebars to adjust the incline and resistance. You have the ability to adjust the angle of the foot pedals. The E35 is slightly longer and heavier giving it a bit more stability. Although both have a 20″-22″ stride, I feel the elliptical motion is more comfortable and fluid on the E35. Most important, the E35 comes with a 2-year labor and 5-year parts warranty, in comparison to the 1-year labor and 3-year parts coverage on the E25. On Amazon.com the Sole E25 received 4.5 stars out of 5 from nine customers, which is am impressive rating for a $1,000 elliptical. *With the Sole E25 Elliptical Trainer Review we attempt to be as accurate as possible. Warranties, features and prices can change without notice. Our review .is based on not only product testing, but also comments, testimonials, reviews and ratings of customers, manufacturer web site and third parties.